A fascinating low-level walk linking stunning villages and castles set amongst the rich farmland and dense forests of Kent’s Eden valley. Underfoot: Generally firm paths and well-drained farmland. However, short sections, particularly along river banks, will be muddy after rain. 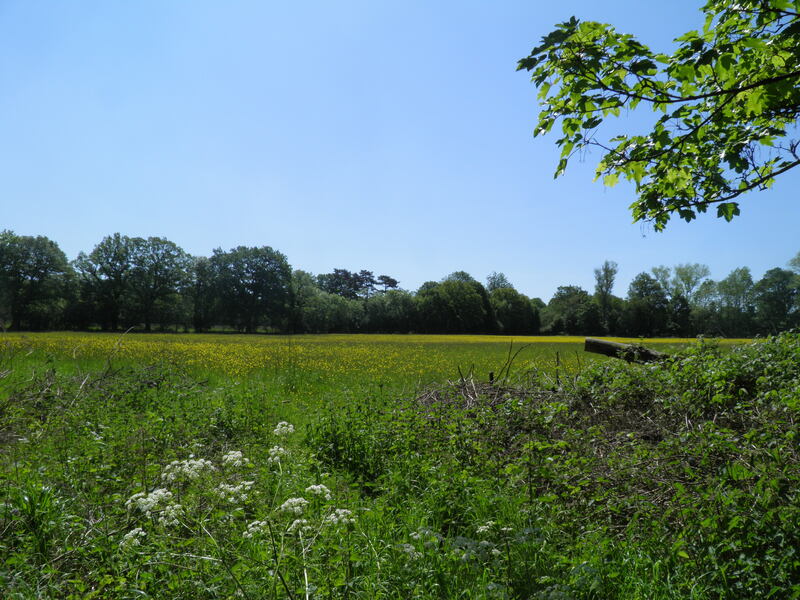 Terrain: Rolling countryside, with generally very gentle climbs and descents throughout. Maps: 1:50,000 Landranger 188 Maidstone & Royal Tunbridge Wells; 1:25,000 Explorer 147 Sevenoaks & Tonbridge. Getting there: Hever is a rural halt on the branch line to Uckfield. Monday-Saturdays, Southern operate trains hourly from London Bridge (41 minutes) via East Croydon (26 minutes) for connections from London Victoria. On Sundays, trains on the branch shuttle from Oxted every hour, where they connect with services from London Victoria via East Croydon for connections from London Bridge. Total journey time from Victoria to Hever is 72 minutes. Useful websites: The route includes parts of the Eden Valley Walk. 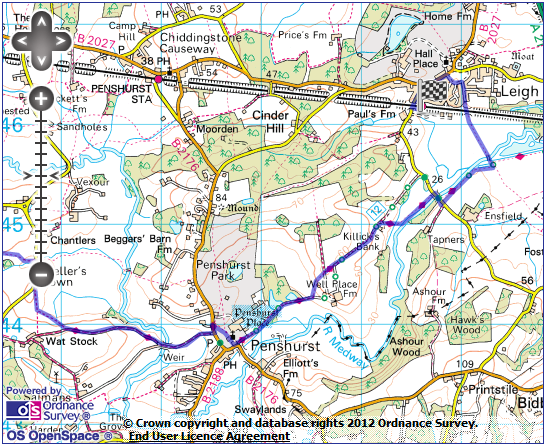 It passes Hever Castle, Chiddingstone Castle and Penshurst Place. Getting home: Monday-Saturday, Leigh is served by an hourly Southern service to London Bridge (62 mins) via East Croydon (44 mins) for connections to London Victoria and Norwood Junction (49 mins) for London Overground connections. On Sundays there is an hourly service to Redhill for connections to London Bridge and London Victoria. Fares: Ticketing for this route is slightly complex as Hever and Leigh are on separate lines. 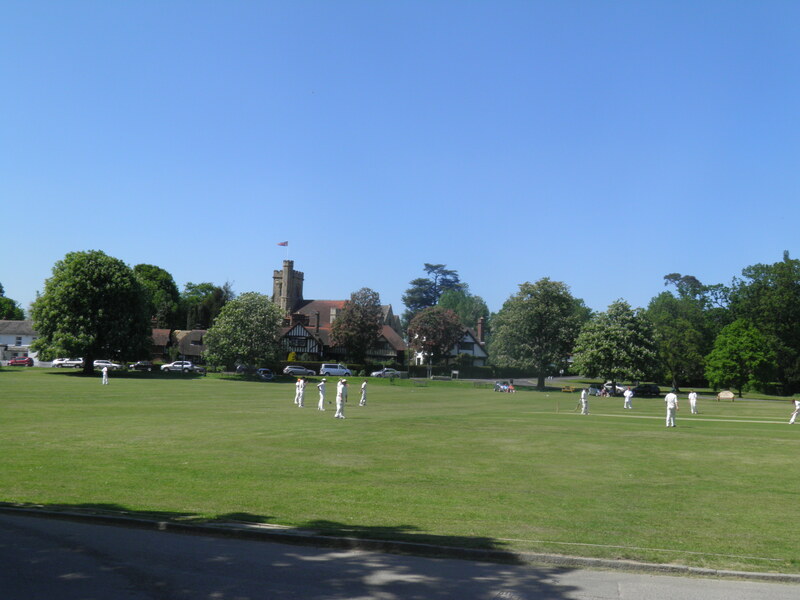 However, both serve stations in Edenbridge, which can be used as a common point. 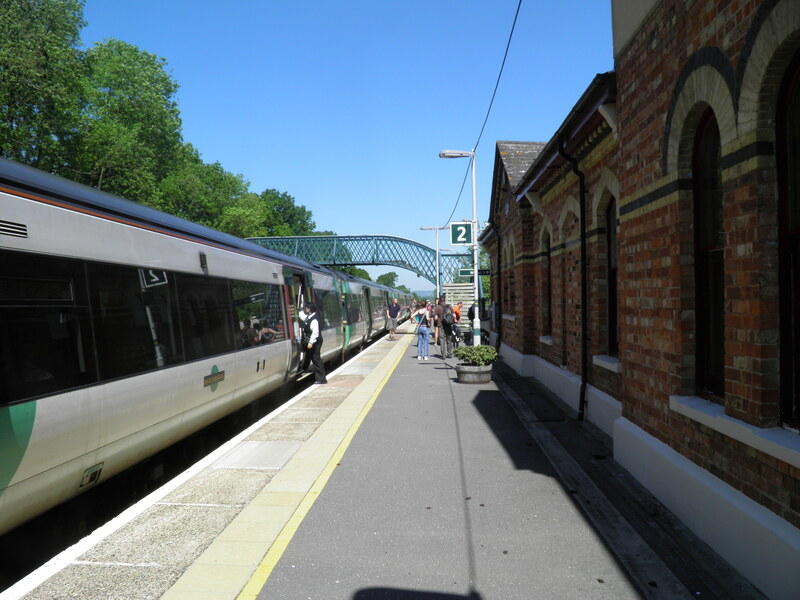 Buy an off-peak return to ‘Edenbridge stations’ for £10.30 (£5.15 child, £6.80 railcard). For the remainder of the outward journey, purchase a Edenbridge Town – Hever anytime single for £1.70 (£0.85 child, £1.15 railcard); for the first part of the return journey, buy a Leigh (Kent) – Edenbridge anytime single for £3.60 (£1.80 child, £2.40 railcard). 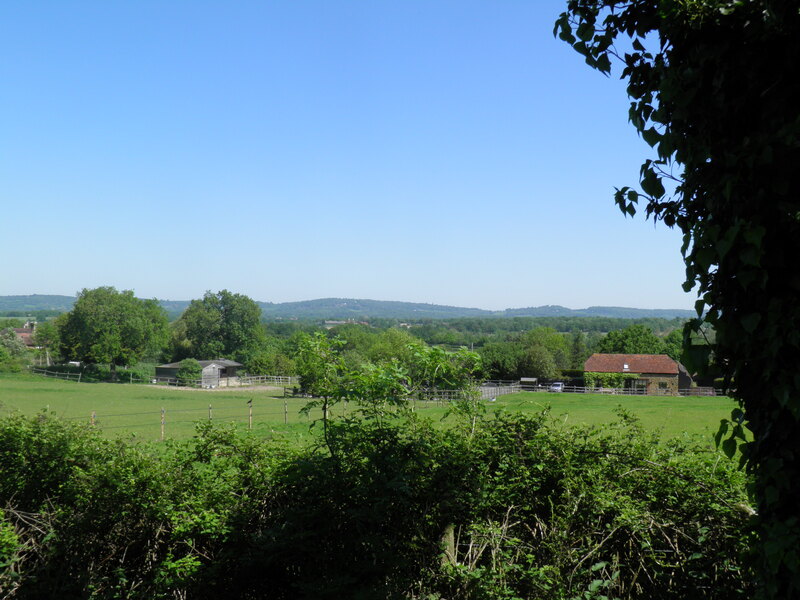 take the station’s drive, lined with coppiced trees and with fine views across the surrounding countryside, to a minor road. Turn right and after 50m left to take a fenced footpath (signed to Hever) beside a gate. Through a kissing gate, the spire of Hever church appears among the trees ahead. Pass through two more gates through a short wooded section. After the second gate, cut right down a field to pass through a further kissing gate and onto a clearer fenced path. Turn left here to reach a busier road. Turn right, then at a junction by a bus shelter, turn left (signed to Penshurst and Tonbridge). Before long, the road climbs gently into the cottages of Hever, with the delightful King Henry VIII pub at the top of the hill. 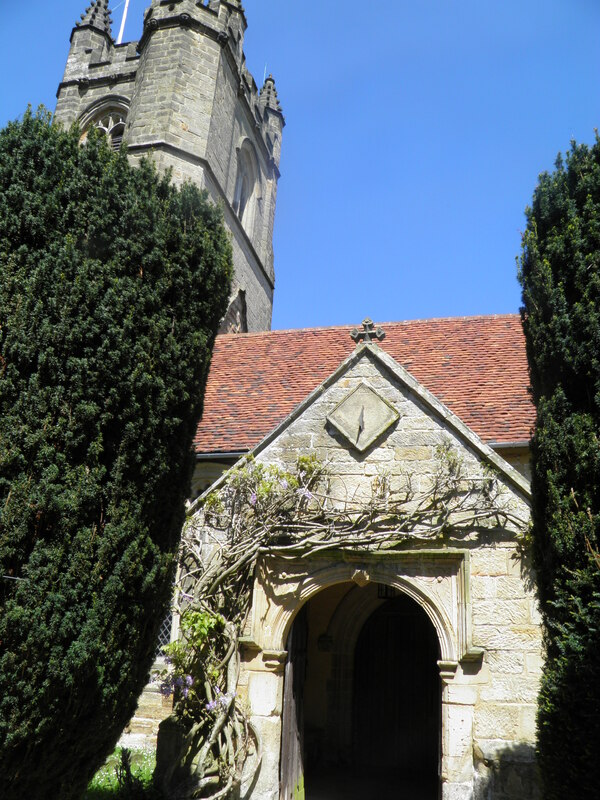 Follow the road round corner of pub, then turn right through the lych gate (footpath sign) into the yew-filled church yard – the visitor entrance to Hever Castle is just ahead, by a fine gatehouse. the little village, is a fine medieval mansion, built as a castle in the 13th century and converted into a domestic building by an early Boleyn in the 15th century. 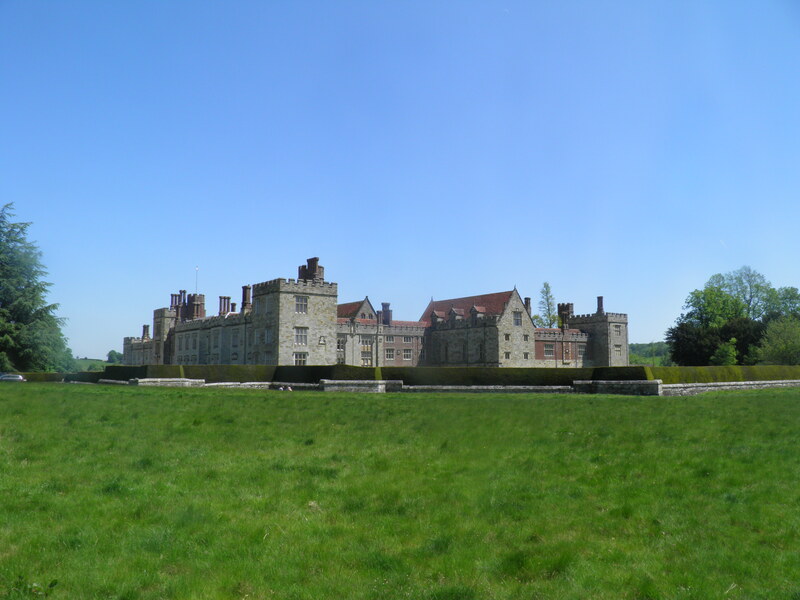 Ann Boleyn’s father, Thomas, inherited the Castle in 1505 and Anne Boleyn spent her childhood here. Following her father’s death in 1539, the Castle passed to Henry VIII, who gave it to Anne of Cleves as part of their annulment settlement. Thomas Boleyn is buried in the parish church of St Peter’s. Keep to the surfaced path past the church and out of the end of churchyard, dropping into a small valley. Beyond, the route becomes a fenced path running between fields and the castle’s drive. 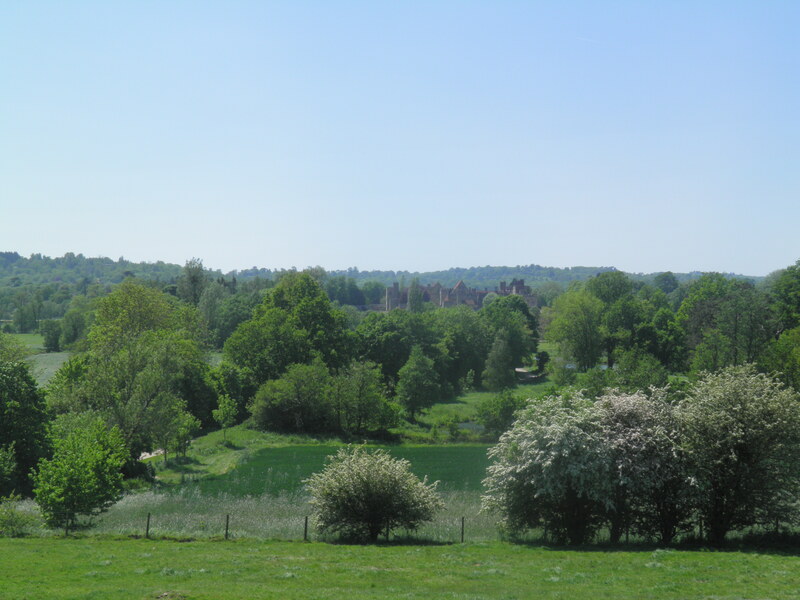 You get a brief glimpse of the huge lake in Hever Castle’s park before the path swings right into Park Wood. 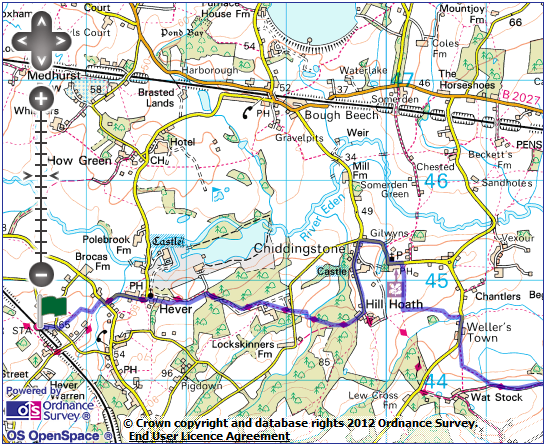 Cross a footbridge over a track and keep ahead through the young woodland, to rejoin the track on the edge of fields. Keep ahead along the track, to reach a pair of isolated houses. Past a gate by the houses, in a car turning area, take the narrow fenced footpath cutting to the left of the second house, passing an eggs and honey honesty box. The path drops along the side of a field to soon reach a minor road. Continue on the path immediately opposite. This meanders along field edges before crossing a small footbridge and climbing a flight of steps in a wood to cross a horse gallop and join a broader path (blue waymarks). Turn left, climbing then descending through woods, at one point dropping through a rock-hewn cutting. Emerge at the end of a little road at the cottages of Hill Hoath. Follow the road round a corner to the left, descending very gently past the outbuildings of Chiddingstone Castle. Beyond the castle’s public entrance gate, you reach a crossroads. Turn right. 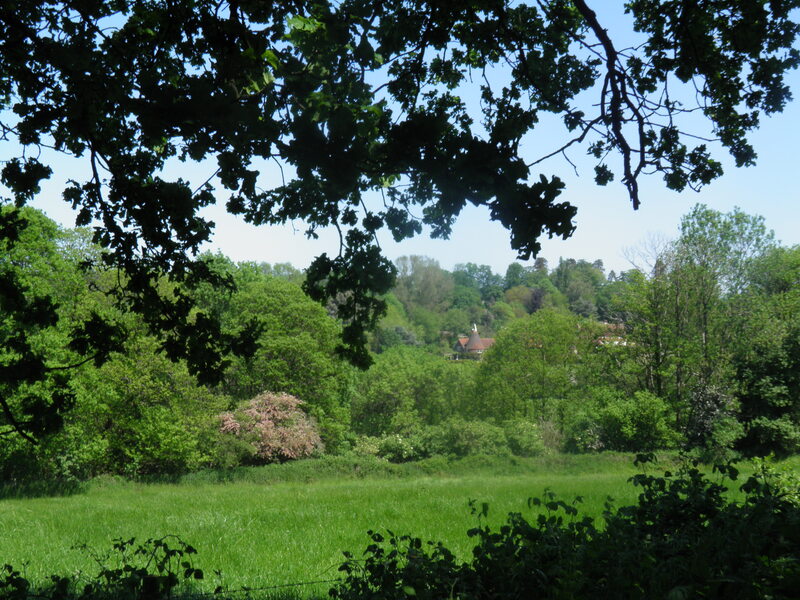 The road turns sharply into the village of Chiddingstone, passing a pretty pond on the left, then crosses a bridge over the castle’s fishing lake, with glimpses of the castle through the trees to right. Astors in 1938, before serving as a troop base during World War 2 and as a school afterwards. It opened to the public in 2008 and displays a huge range of antiquities and artefacts collected by Denys Bower, who owned the castle from 1955 to 1977. Road then turns sharply again by the Castle Inn to pass between the church and a lovely row of half-timbered buildings, including a post office and tea room. Trust and it’s centre is considered to be one of the best preserved examples of a Tudor village in the country. It has starred as a location in numerous films, including Elizabeth R, starring Glenda Jackson. 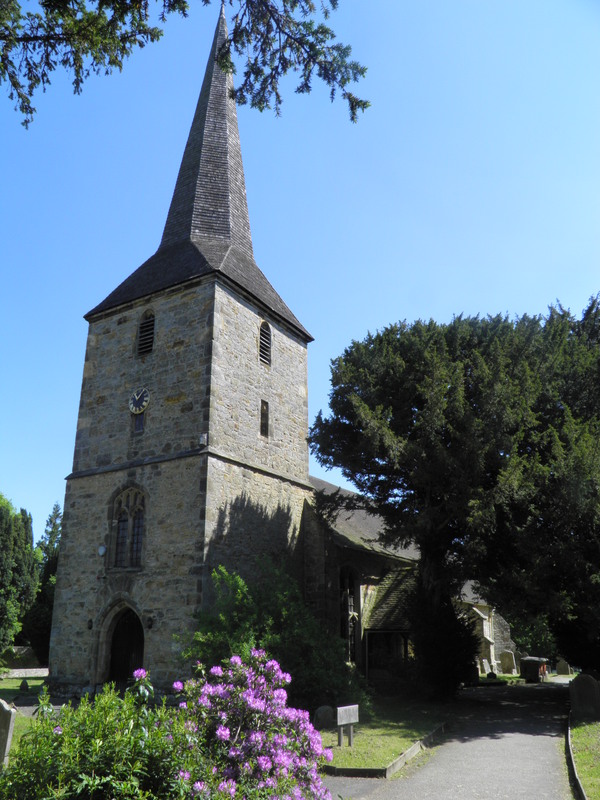 The fine parish church dominates the north side of the road – in the churchyard is a gazebo-like structure built in the 18th century by the local landowning Streatfeild family – it conceals steps down to the family vault. Continue ahead past village school. Immediately after school, path leads R for 200m to the Chiding Stone. 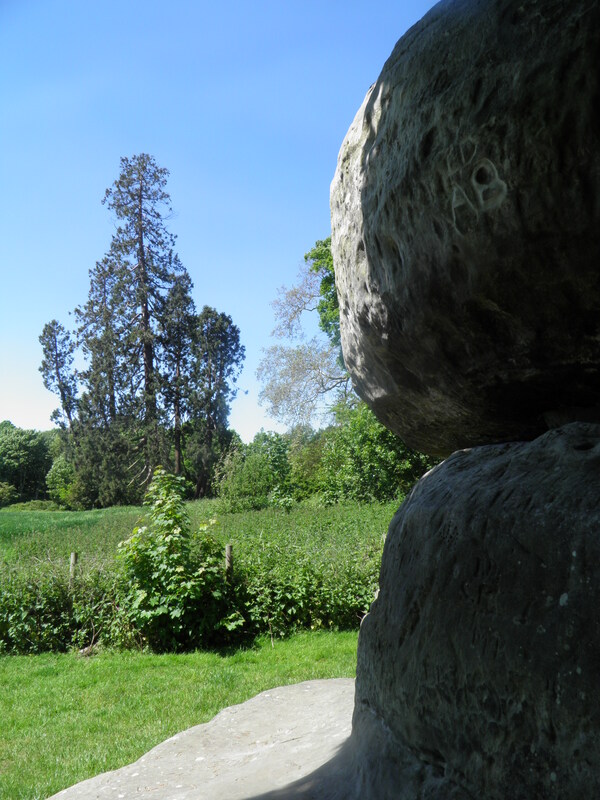 If visiting the stone, return by the way you came afterwards. the edge of the village, supposedly named for its use as a location for punishments, or ‘chidings’. Inevitably, it is claimed that the village’s name comes from the stone, though the reality is that it is more likely to be named after an Anglo-Saxon family named Chidda. Otherwise, 50m further on, take the footpath signposted to the right. The path runs between hedges over a low hill, then descends through an arable field. 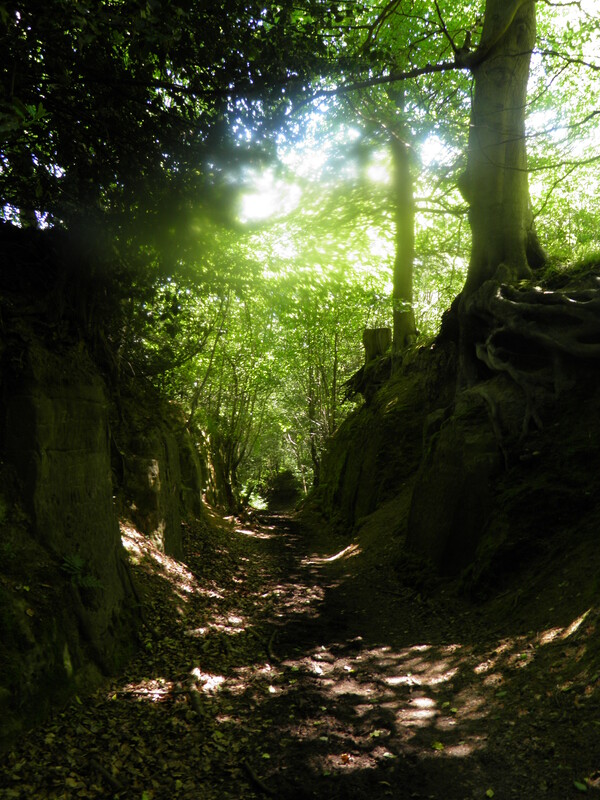 On reaching a stile into a small wooded area, do not cross it, but instead turn L on narrower path across the field. Through the hedge, the path leads across another large field to reach a road at the entrance to the hamlet of Wellers Town. Turn right, climbing steeply past houses. Past a row of terraced estate cottages, the road curves slightly right. 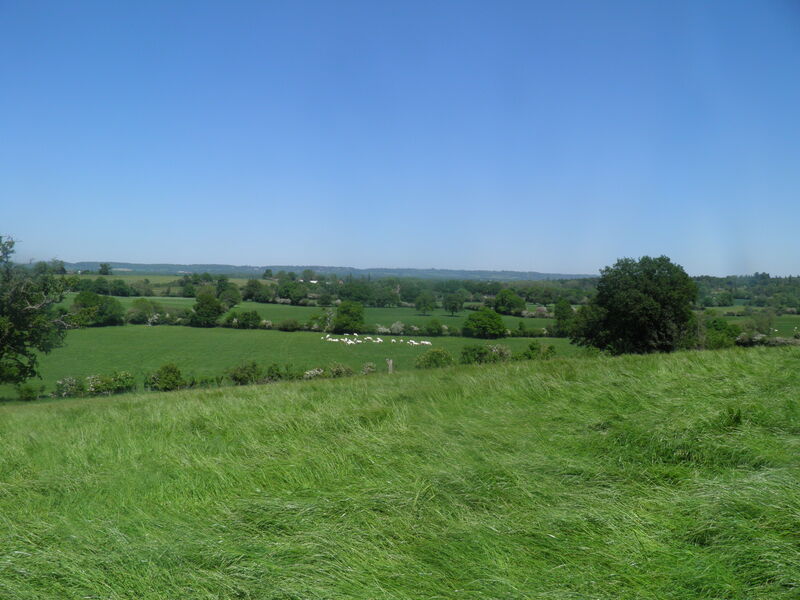 Follow the footpath sign to the left over a stile, with a pleasant panorama of rolling green fields and woods ahead. The route from here is a little unclear, but you basically drop ahead towards the hedgerow in the dip ahead, following the faint remains of a former hedgerow downhill. At the bottom, cross a small footbridge and pass through the kissing gate, following the waymark to the left. After a pair of stiles, you enter another field without a clear path. Climbing very slightly, cut across towards the mid point of the hedge opposite to locate a pair of stiles and a footbridge. In the next field, keep to the right of the isolated clump of trees, then cut uphill to stile onto a shady track. Turn left. The track runs along a ridge with fine views, before slowly descending into the Eden valley, where it joins a small road and crosses the reed-lined Eden. for about 200m, before turning right into Penshurst Place’s parkland at a footpath sign, taking the path heading sharp right. although some are Victorian replicas. Cut across the grass in front of the huge mansion, heading for pinnacle church tower ahead. 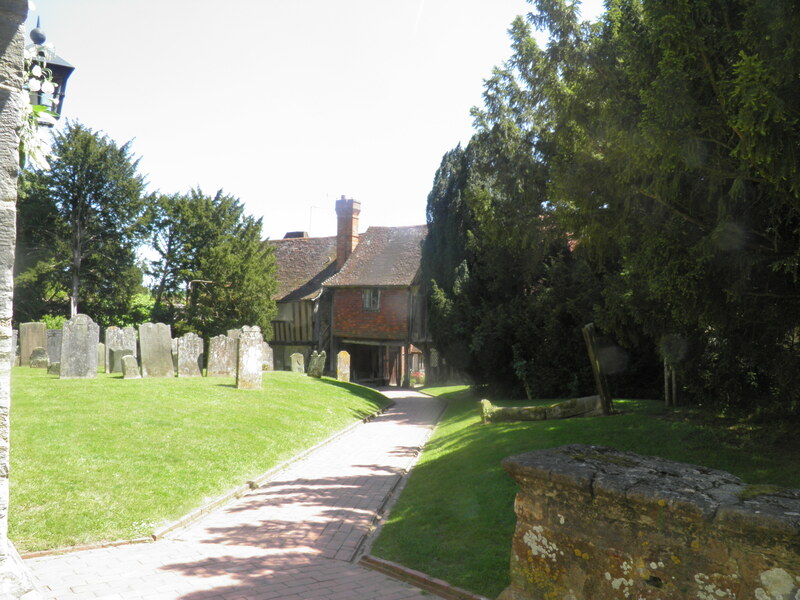 Through the kissing gate into the church yard, pass in front of a large tower and then under a half timbered house, bearing the motto ‘My flesh also shall rest in hope’. Emerge into a lovely little close of cottages, with an enamel ‘GR’ post box. 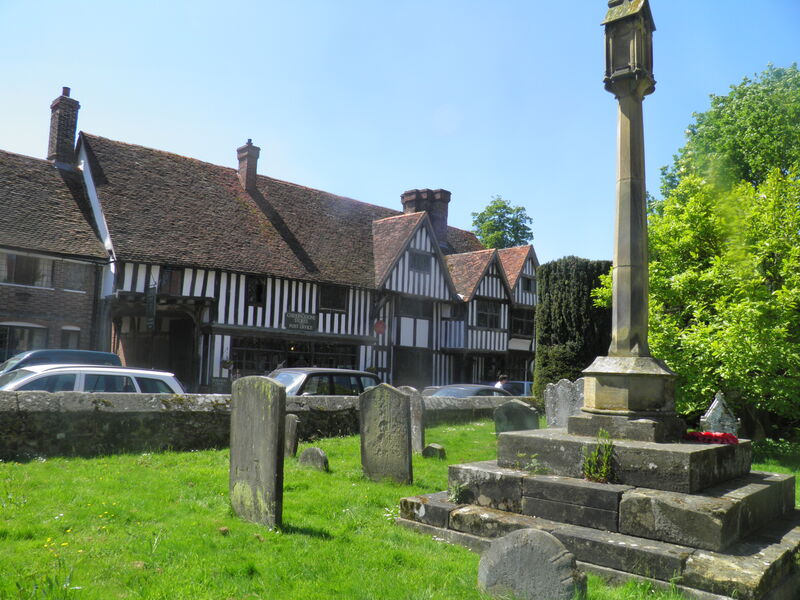 To visit the centre of Penshurst village, including the Leicester Arms Hotel, turn right along the road. the Penshurst Place grounds (footpath sign to Killicks Bank). The road runs alongside the brick wall of the gardens and past a car park (turn left for Penshurst Place’s entrance, shop and cafe). Beyond, the little road runs through the pleasant estate, passing a pair of small lakes. Beyond the second, follow a footpath sign left, passing through pair of squeeze stiles to cut relatively steeply across a grassy hillside. At the top, keep straight ahead through a stile to join the track dropping gently across open fields, the outskirts of Tonbridge visible ahead. On reaching the houses at Killicks Bank, follow the footpath sign to the right, through a squeeze stile into field. Medway. 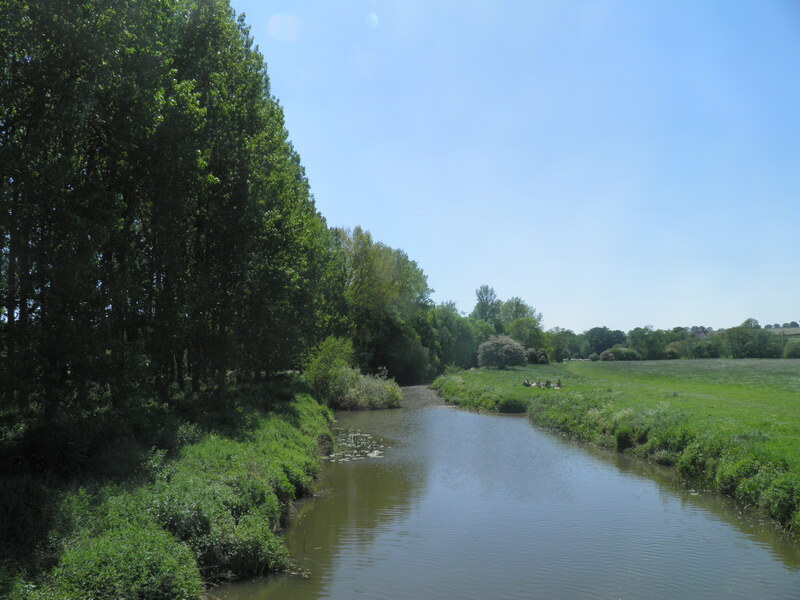 From here, swing left to join the bank of main channel and follow it to single-arch Ensfield Bridge ahead. Cross the bridge and just after, head left on a footpath and cycle way towards Tonbridge. This path runs along the bank above the river, before dropping down to run through the woods beside it. At a waymark post, turn left over a concrete bridge across a side channel and cross the meadow to a footbridge over the Medway. Keep straight ahead across the flat pastures. In the second field, pass through a kissing gate onto a small track leading to a bridge under the railway line. which you follow ahead to the large village green. Turn left on the road around edge of green. At the main road, turn left along Leigh’s pleasant main street, with a close of half-timbered almshouses and the Bat & Ball pub. By a second pub – the Fleur de Lis – turn left following signs for the station. For London-bound trains pass under the bridge and turn left up to the platform.